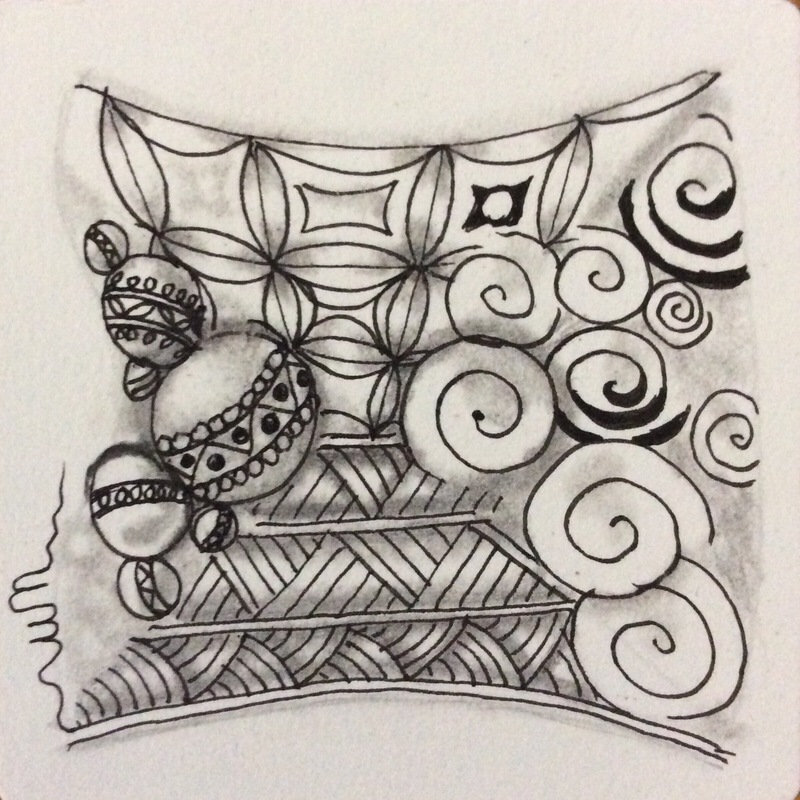 Lately, instead of blogging, I have been tangling away for a “first workshop.” The Zentangle Method® workshop is being conducted for students and faculty of a local medical school. This may be a “one shot” as the group is very busy with classes and studies. So I need to present as many workable tangles as possible into a 2-hour workshop. It’s not for another six weeks or so, but I want to give participants an idea of what can be done with just six or seven basic tangles. The purpose of the workshop is to help students to learn an active meditation technique. Tangling can help them relax, relieve anxiety especially before exams, and learn focus and concentration tools that can be applied to studying. The purpose of the examples is to help them see the versatility of using only a few patterns to get them started. These are the first tiles I have tangled with just the first six (or seven) patterns I will be teaching during that workshop. I plan to teach both Tipple and Jetties together, because I kind of think of them as the same basic tangle–a basic version and a version with attitude. 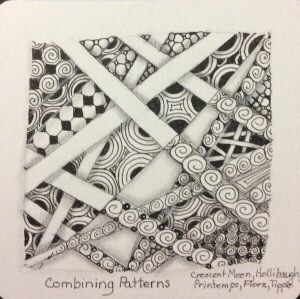 The other tangles will include Crescent Moon, Hollibaugh, Florz, Printemps, and Shattuck. And Bales, if there is time. 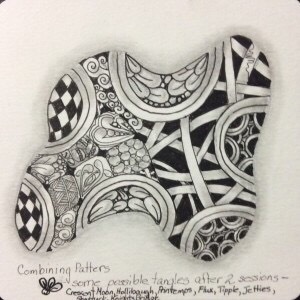 These should provide an idea of the versatility of learning and tangling with such a limited number of patterns. 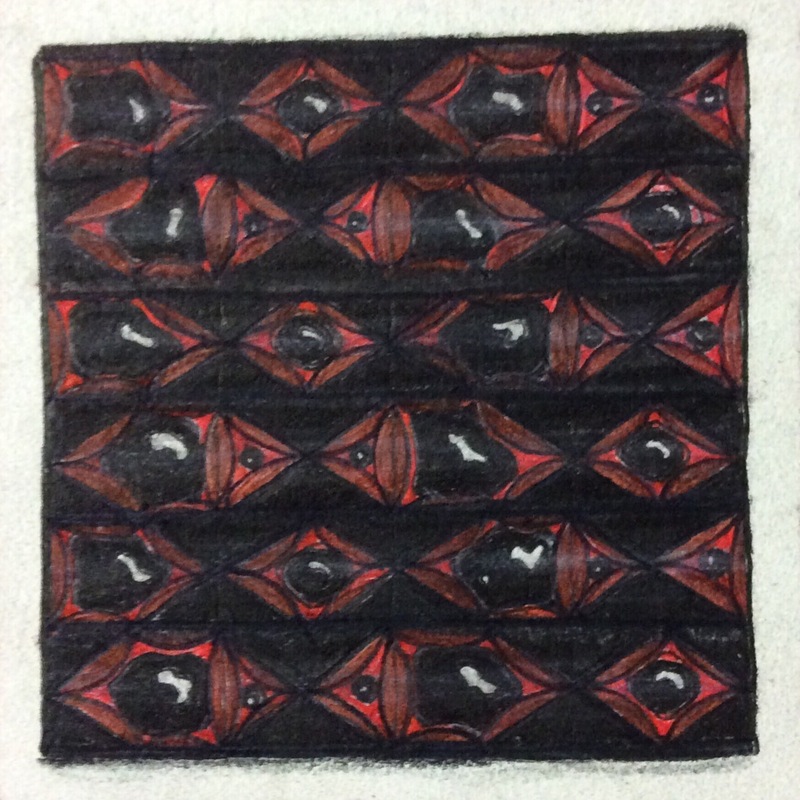 In addition, I am working up tiles that would include tangles from a second session. That session would include Bales (if not covered in the first session), Knight’s Bridge, Flux (both versions), Mooka, Poke Root and Poke Leaf. So much more versatility with only five more patterns! More to be posted soon! 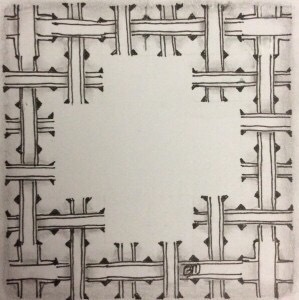 A month ago, the thought of tangling on a black tile–especially with a white Gelly Roll® pen–made my stomach knot up. I kept trying, but it was more difficult to conquer the fear of black tiles than anything I’ve ever done–except quitting smoking; I’m still working hard on that. 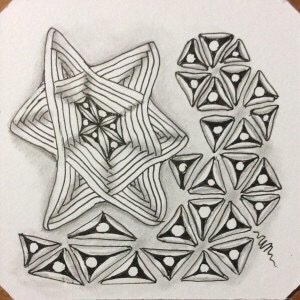 When I was at CZT Seminar 27 last month in Providence, RI, the topic came up in a conversation with Maria Thomas, one of the Zentangle® founders, about fear of tangling on black. Every wobble of the white pen is so vivid. 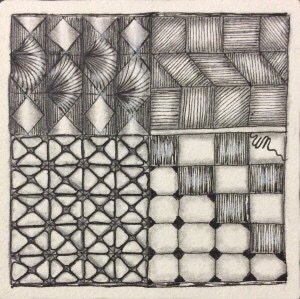 Amazingly, many talented tanglers had trouble working with black tiles. Maria thought about it for a moment and said, “Start with gray.” The next session was starting, so there was no opportunity for clarification. But I thought about that, and thought hard. When I returned home, I tried several things. 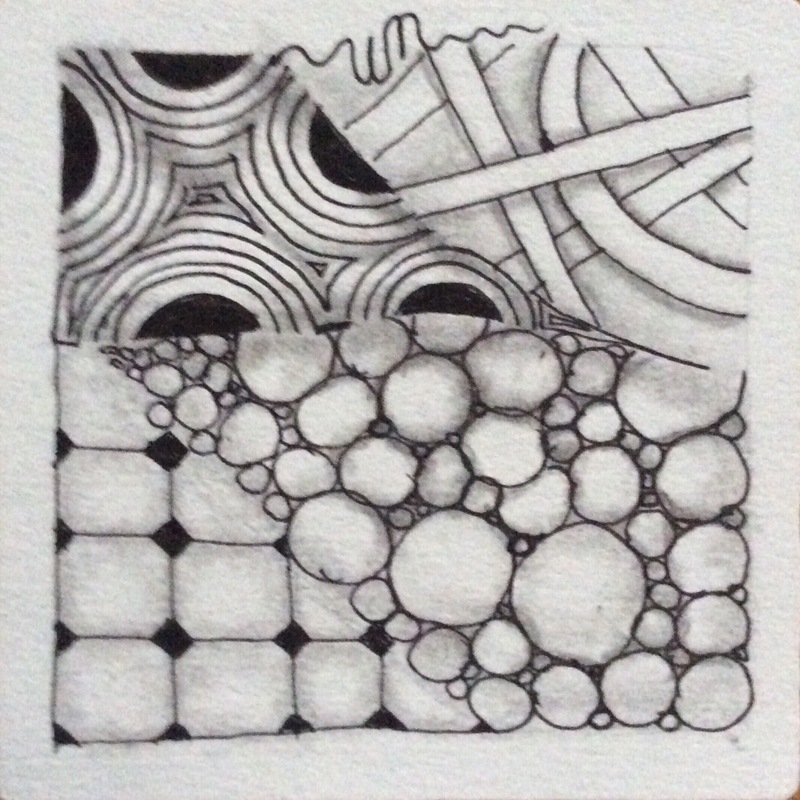 I tried gray markers and brush pens first, but they just disappeared into the black tiles. 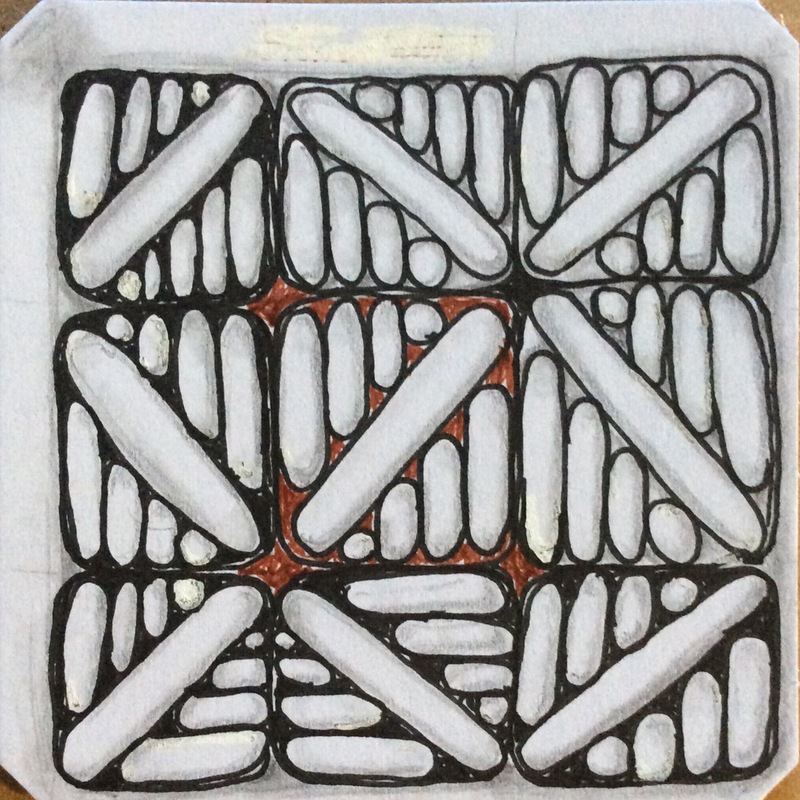 Next, I tried some light gray color pencils, which worked OK in terms of showing up on the black tile, but required a lot of pressure and constant sharpening. Using gray gel pens produced better results. I even tried using gray markers and gel pens on top of white ink. Nothing was working for me. So I simply turned to some of the less bright Gelly Roll Moonlight pens I had in my arsenal. 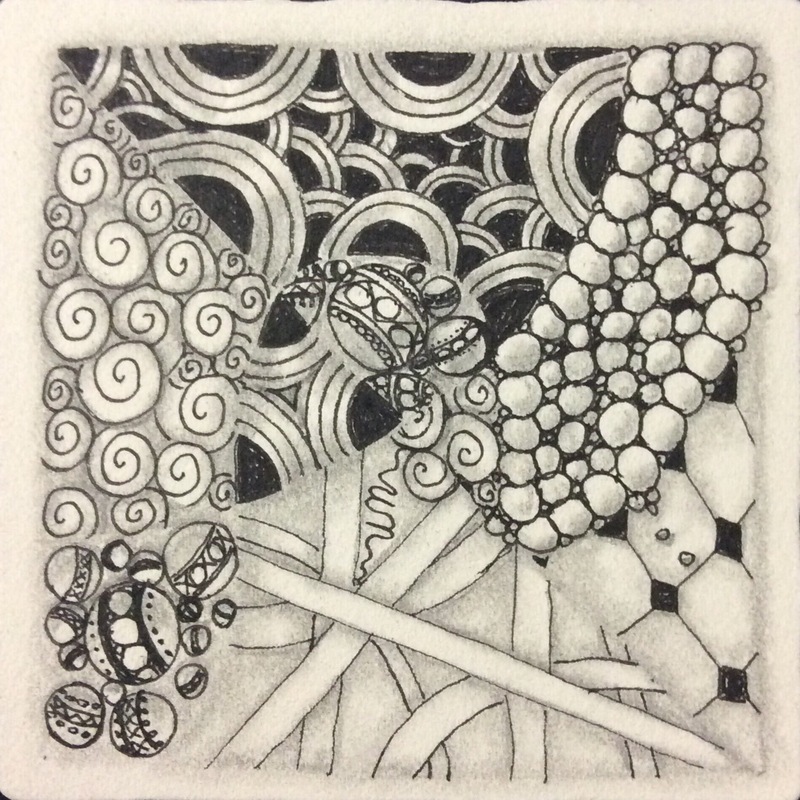 Those gave me a feeling that not every wobble was showing up on my tiles, and helped me get comfortable with tangling on black. 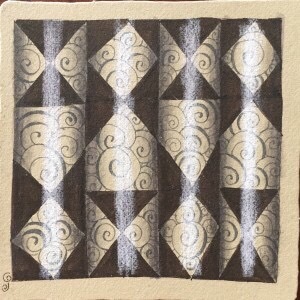 Finally, I started tangling on black tiles with white gel pens again–but not with the recommended Gelly Roll. Instead, I used a slightly finer tipped white pen by Uniball, called Angelic. That slightly finer line made the difference for me. From there, it was nothing to pick up the white Gelly Roll without thinking, and tangling away without fear, and quite happily! 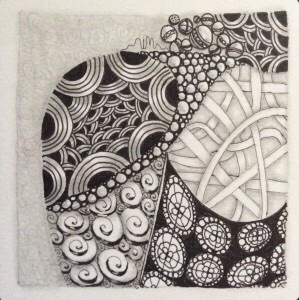 For me, it was a process to lose the fear of tangling white on black. Although I am still unclear of what Maria meant by suggesting I start with gray, her suggestion got me trying new things with black tiles. I found that tangling with colors was a lot less scary. I also found that moving to a finer white pen helped a lot, especially with working towards using the broader white Gelly Roll pen. And sometimes, we need that process of discovering what works better for us before we can pick up the expected tools again. 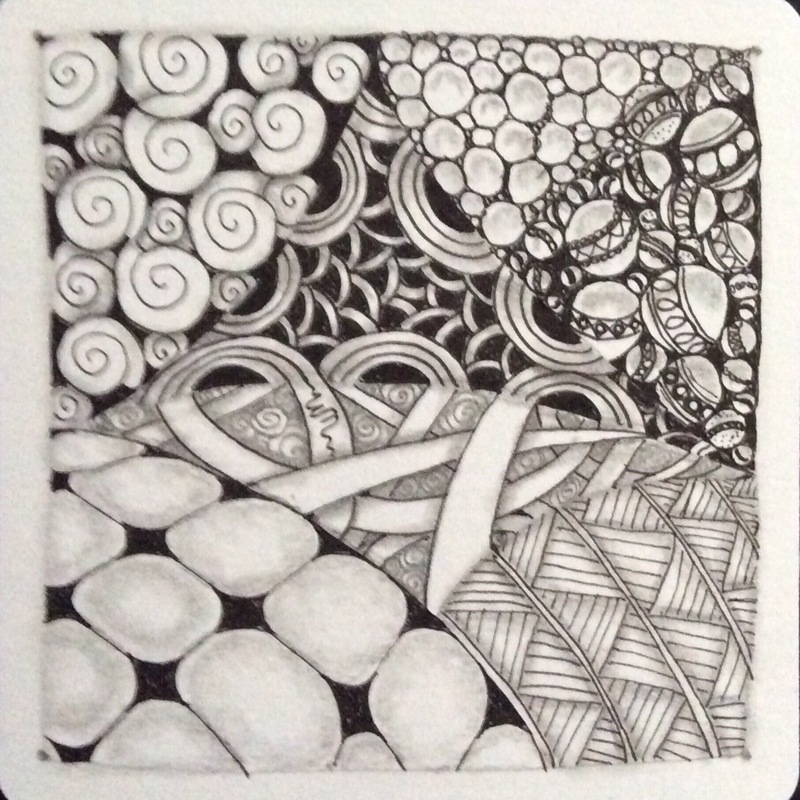 I guess what I am trying to say is that I couldn’t conquer my fear of tangling in white on black until I had the right tools to play with–tools that made it easier for me to move from cringing to creating. 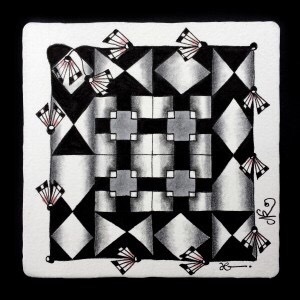 Note to readers: I am the guilty party–I inflicted abuse on a poor defenseless classic black Zentangle® tile. 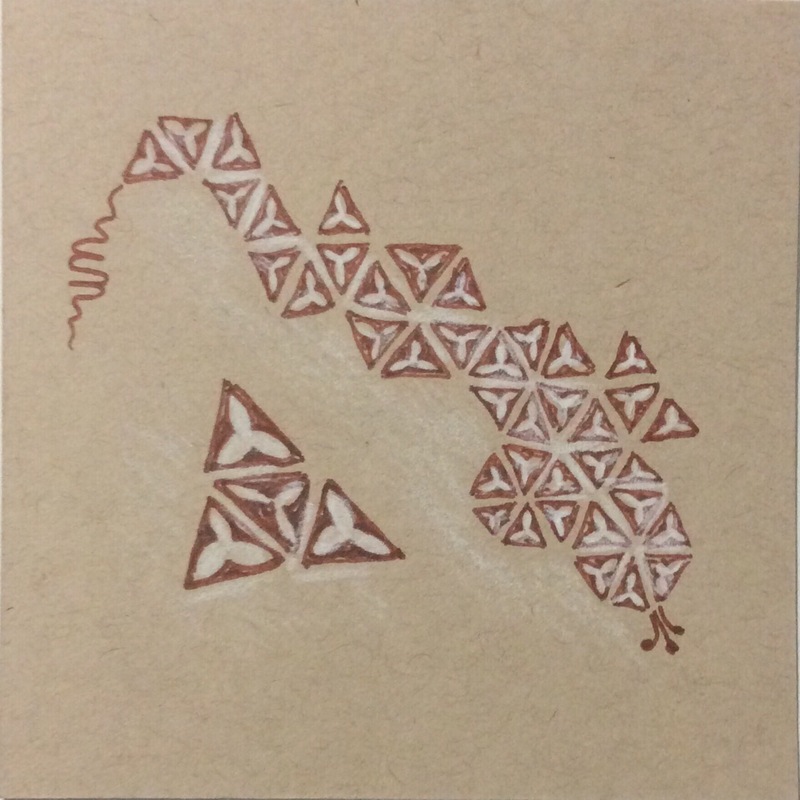 I am ashamed and remorseful, but the fact exists–I mistreated my precious tile. 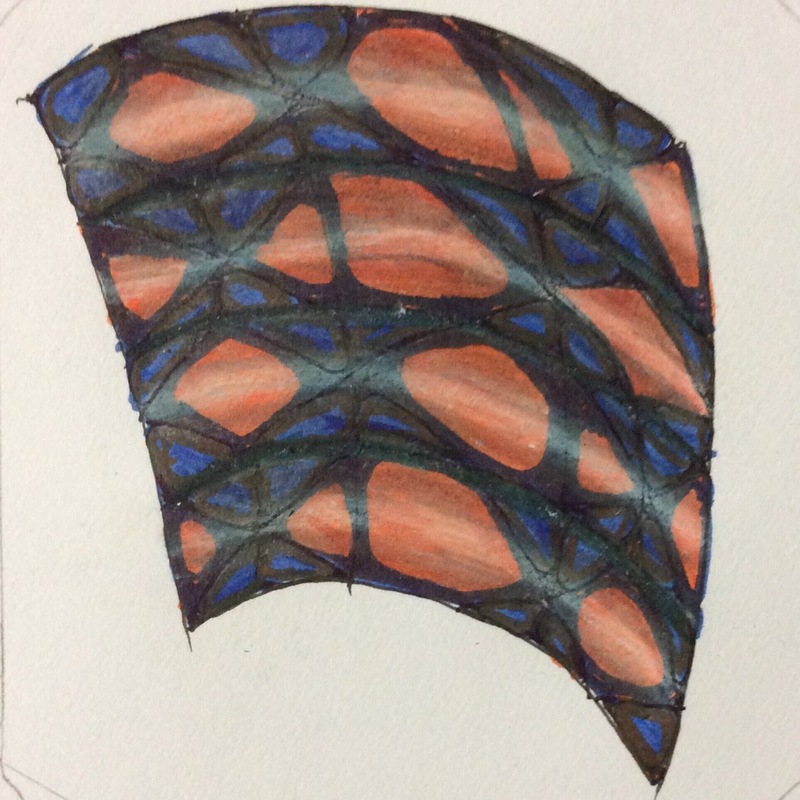 Below is a reconstruction of the original tangle on this poor tile’s surface. I started out right. I gave thanks and appreciation for my time and the quality of the materials before me, to the comfortable tangling space, for the opportunity to create something beautiful. However, all this took place under the influence of a little pill meant to help me sleep. That is no excuse for the behavior my tile will explain. But it was a circumstance, one which even led to my dating the original work as June 26, 1921! I can’t even explain where that date came from, or how I could have believed I was creating magic with my tile. But that’s the start of this tale. Only she–my abused tile–can tell the actual non-drug-influenced story. Good evening, readers. My name isn’t important, but you can call me Glitter, as that’s the name I chose once DrEllie fixed me. But let me start at the beginning. Ellie is an insomniac. Most nights she fits in a couple of hours of sleep, but sometimes she is awake for 48 hours or more straight. Most prescription sleep aids cause sleep walking. She has already fallen down the steps twice, so she refuses to take them. Instead, her doctor prescribed a tranquilizer that she can take at bedtime–but only half a pill. Those things are wicked! Last night, the half pill was not working, even as she partially tangled tiles to send to friends who sent her some before. She already felt badly about being so far behind. Unfortunately, even the tangling, along with the sleeping dose, were not helping her get sleepy. After a few hours, she decided to take the other half pill. Over the next hour or so, I watched as her drawing deteriorated across half a dozen tiles. Crooked lines that didn’t meet, circles that looked like–well, not circles at all. Finally, she picked me up–the first black tile of the bunch. And then she picked up the white gel pen. 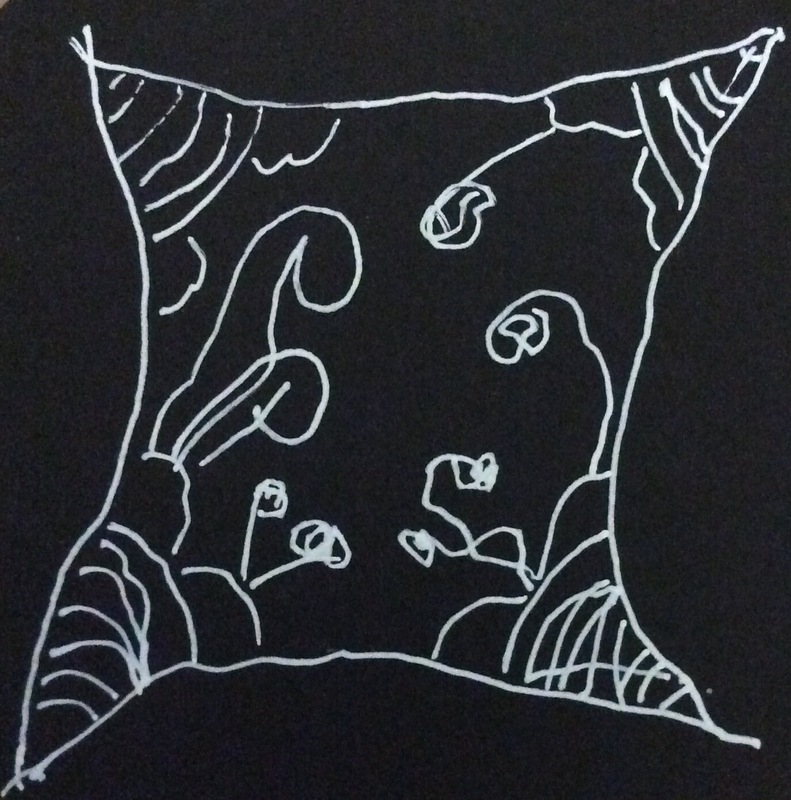 And I felt her drawing all over me–a sort of curved frame, some “curved” lines in the corners that resembled squiggles more than lines, the worst mooka I’ve seen her draw since she was first learning it–this one looked like a misshapen Meerschaum pipe!–and some really off-base fescue that looked like squiggly blobs with jagged stems. I begged her to stop–that she was destroying my beauty and anything akin to balanced composition. All she did was scowl at me and keep drawing. Suddenly, she lifted her pen and dropped it on the drawing board. The pen rolled off the surface and out of sight. “I need to cap my pen!” she told the dog who sleepily lifted his head, regarding her through barely open eyes. He was tired, too. He was only there to keep her company. Ellie almost fell off her chair to search for the pen. She began crawling around on hands and knees in her search. And she barely kept herself from toppling over more than once. At least twice, she asked the dog what she was looking for. The dog had fallen asleep again and didn’t answer. 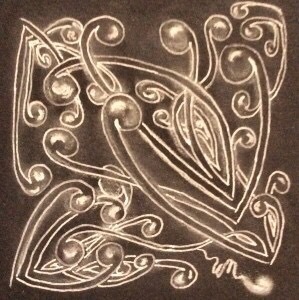 Finally, she found the white gel pen (hard to do on white tile flooring with only overhead lights to help see). It took her a while to stand up again, using the chair and table top for support. I watched her sway back and forth as she tried to remember what she needed to do next. “The cap,” she finally whispered. The cap was easy enough to find. It was right next to me, on a clean black tile she hadn’t used yet. I guess the tile was patiently awaiting its turn. After three tries, Ellie finally clicked the pen closed and very carefully set it on top of me. Still standing and swaying, she murmured to no one in particular, “I think the meds have kicked in.” I watched as she made a drunkard’s path to the staircase leading to her bedroom. I held my breath as she navigated the steps. The dog, who follows her everywhere and normally pushes past her up the stairs, quietly sat waiting until she reached the bedroom door and turned out the hall light. Then he zipped up after her. It’s me again–Ellie. I don’t remember climbing into bed, but that’s where I was when I overslept this morning. Ten-thirty! Where had the time gone? After throwing on some clothes, I made my way downstairs. I made a cup of coffee, and wandered over to my tangling area. I vaguely remembered working on a group of tiles, but it took a few minutes to remember that I was creating some traveling tile project pieces to get in the mail. 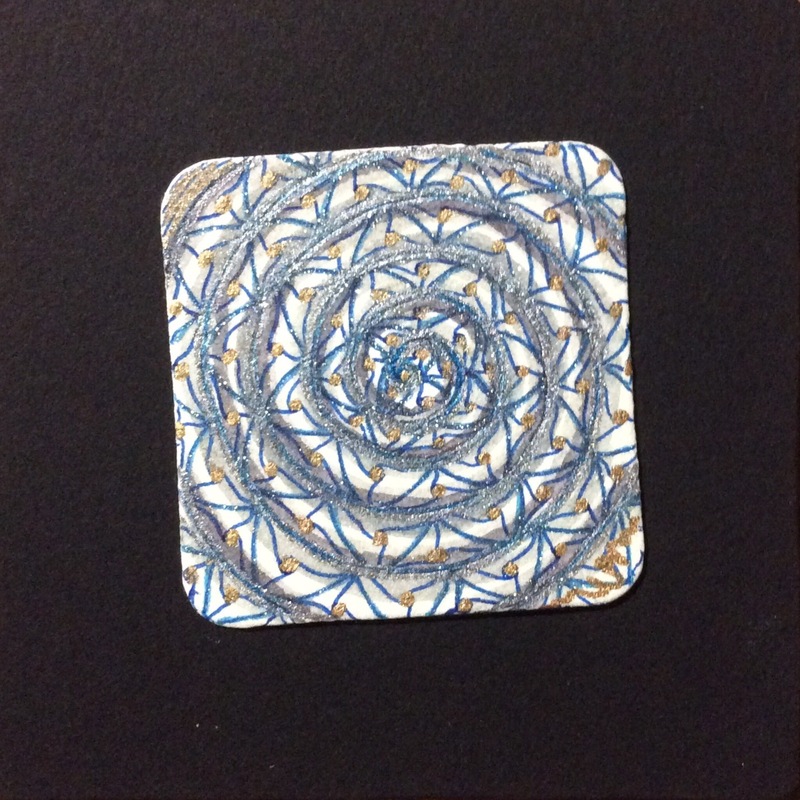 I saw Glitter–nowhere near resembling her new name–sitting in my active drawing area. Then I saw the pile of started tiles. Setting the coffee mug down, I examined each tile. The first two were awful, but there was improvement as I got deeper into the short stack. I must have tangled the lower ones first, placing each next tile on top as I finished it. I cringed at the higher tiles–a two-year-old would have produced better results. Next, I picked up Glitter, and tears began rolling down my face. She was utterly disfigured–and I knew I had done this to her. Only the original border lines were passable. Through my tears, I heard, “You can fix me! 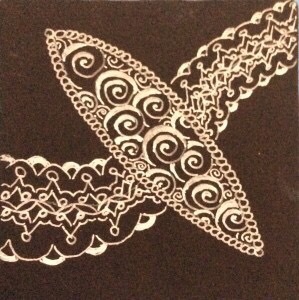 There are no mistakes in Zentangle!” I stared at her. “How?” I asked, barely above a whisper. Smiling now, I dug out not only my standard supplies, but also my Gelly Roll metalic and Stardust pens. For good measure, I also pulled out my Souffle pens, just in case. Good thing, because I couldn’t find my gray brush pen, and the black Soufflé dries beautifully gray. It’s Glitter again. I’ll finish the story. The first thing Ellie did was take out her Micron 08. Where she could, she smoothed out curves, redefined lines, fixed up dangly end where lines met and then some. It sort of tickled, but it also hurt a little. Next, she obliterated groups of lines that were supposed to be parallel but–well, let’s say they were lines that went in interesting directions, with some even crossing multiple others. That was really painful–like being deliberately abraided! Somehow, she managed to save and refine the mooka and fixed the fescue. Then she fixed up the crescent moons she had in some interesting corners, redefined some, and used blue gel ink to sort of shade them. None of that hurt as much as the abraiding feel, but it was still uncomfortable. Sitting back, she looked at all the white that disappeared under the black pen. And she stared and stared. 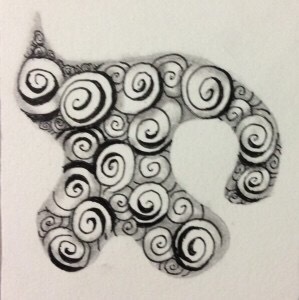 Finally, she picked up the white gel pen again and redrew those curved parallel lines she obliterated earlier. She looked at the variety of Sakura® gels pens she took out earlier, and I saw her smile. 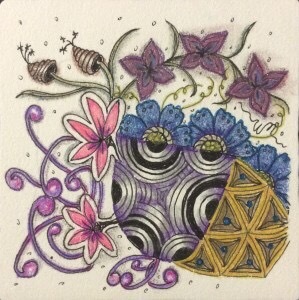 A new pattern from Germany’s Jutta Gladnigg was shared on The Zentangle Mosaic® app recently, and I immediately asked for permission to share it. 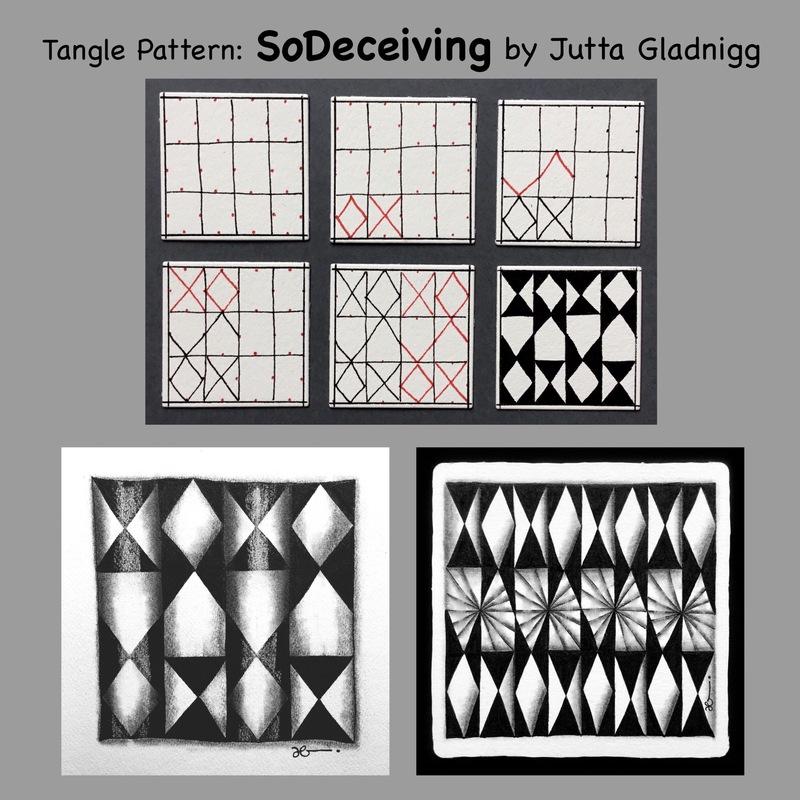 Jutta has the most amazing eye for finding patterns in unexpected places. This one is based on a logo she spotted on a business vehicle while waiting to cross a busy street. 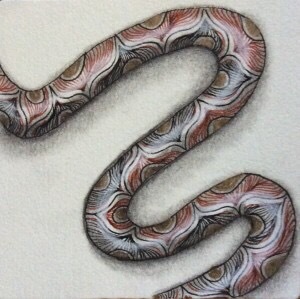 The 3-D effect caught her eye, and she was determined to deconstruct it for tangling. 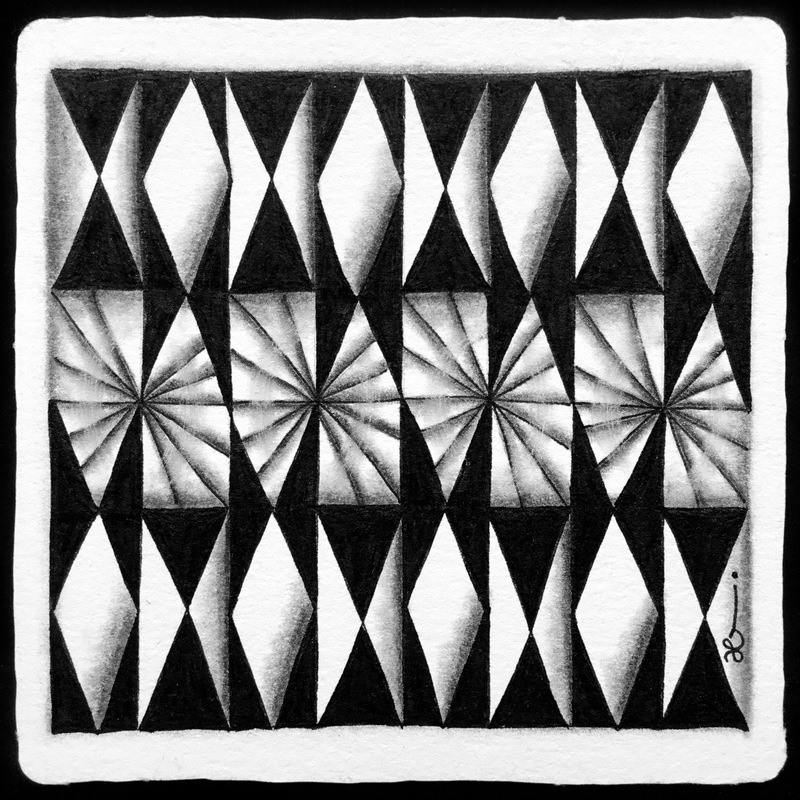 Jutta uses bold shading with softer, darker graphite than many tanglers use, and it is that darker shade that give her work such depth and dimension. 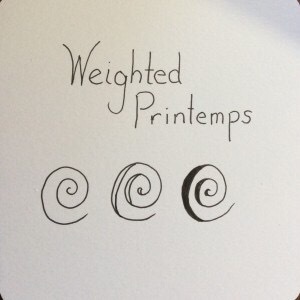 Below is NY tangler and CZT Jody Genovese’s interpretation of SoDeceiving, beautifully filled with the Printemps pattern. Using General’s Charcoal White pencil really brings out the roundness of the columns and adds so much light. 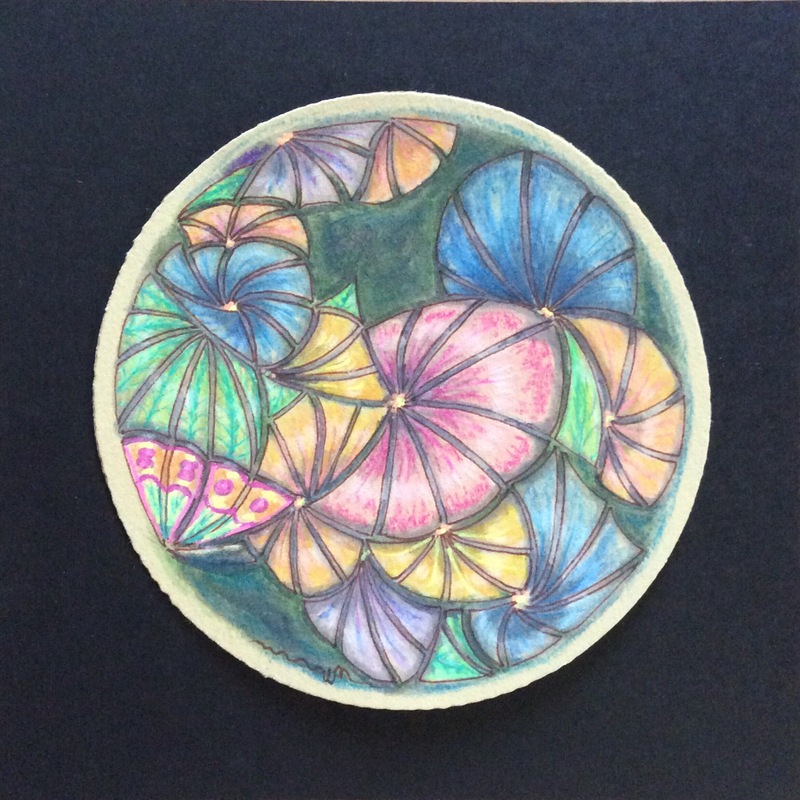 This tile was created by Jutta and German tangler and CZT Nadine Roller, incorporating two of Nadine’s beautiful patterns. My own efforts with SoDeceiving took a rather different direction as I played with variations inspired by the tiles above. I continue to play with this marvelous pattern. A quick-and-dirty curved version is giving me still more ideas to play with, this one filled with ‘Nzeppel. 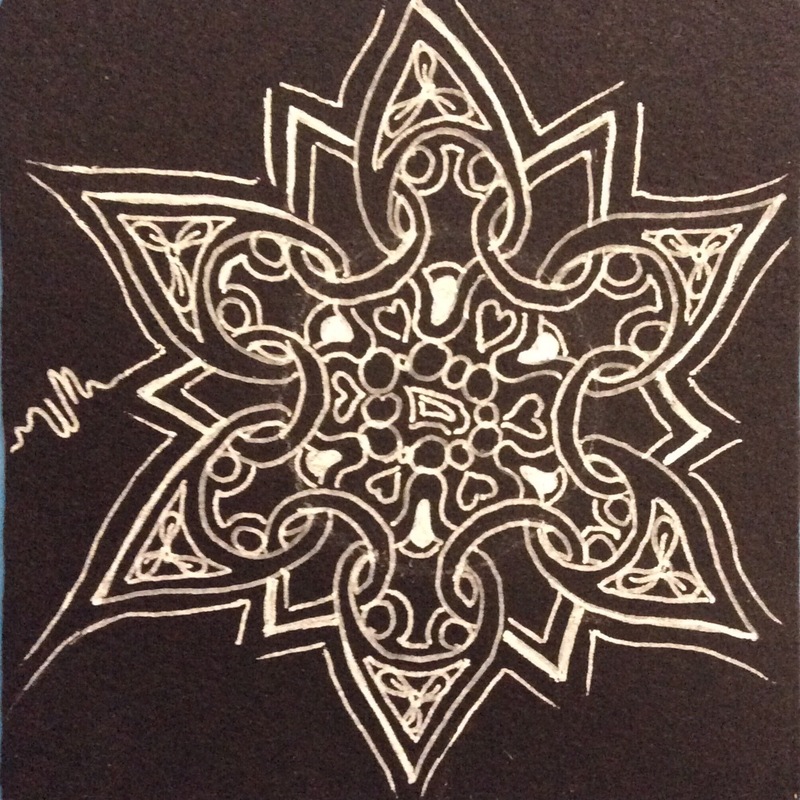 Visit Nadine’s website to see her wonderful patterns, read her blogs, and get some wonderful inspiration and lessons. Although mostly in German, there are English language portions, and her step-outs are so clear that language is not a problem. 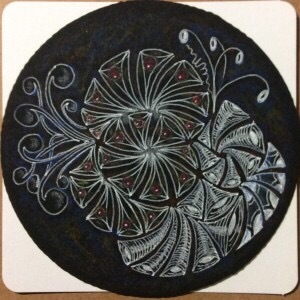 Today, Jutta has just posted a new flower-like pattern that she shared for the first time on the Zentangle Mosaic® app. Hopefully, she will allow me to post the step-out for it here. You are going to love it! 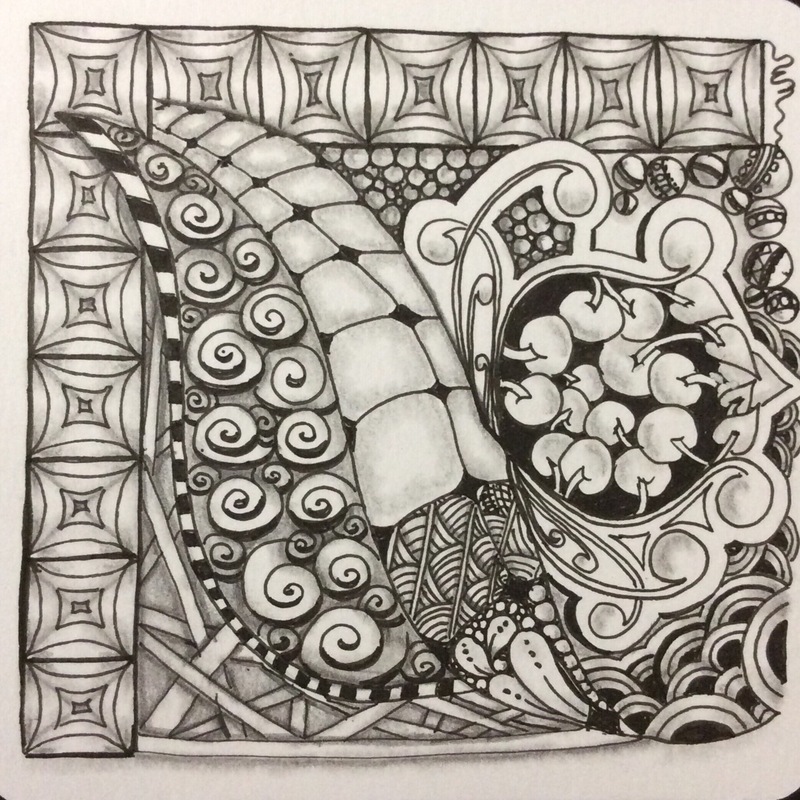 The Zentangle Mosaic app is available for the iPhone/iPad from the Apple Store, and for Android devices from the Google Play Store. Follow Jutta on Mosaic as JuttaGladnigg, Nadine as NadineRollerCZT, Jody as JodyGenoveseCZT, and me as DrEllieCZT.